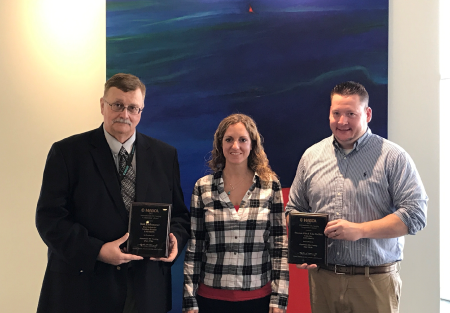 The Cambridge Division of Pace Industries continued its history of winning awards at the NADCA International Die Casting Design Competition. In fact, it was just two years ago when we last won an award at this very competition. Check back in our blog archives for our January 14th, 2016 blog to learn more about that story. This year, Cambridge won the Aluminum under 1 lb. division, with a Mid – Housing for L3 Technologies. 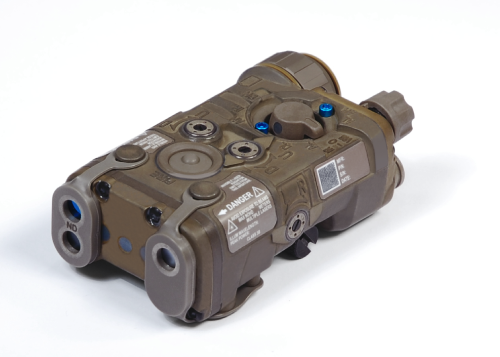 This is the main housing for a Next Gen Aiming Laser to be placed on many weapons for the U.S. military, to pair with all generations of night vision devices. The Cambridge team was given a tough task in replacing a piece that was previously conceived in plastic, that now needed to be cast in aluminum. We designed a part that would not add weight, but significantly increase the structural integrity on the part. Not only did we succeed, but we exceeded all expectations creating a part with walls less than 0.05” thick, yet with tremendous detail and durability. The Cambridge division was excited to partner with L3 Technologies on this project. Through many hours of discussions and brain storming sessions, together we designed a part that both Pace and L3 Technologies were proud to be producing. Keith Liadis of L3 Technologies said this about Pace, “It was a great experience working with the Pace team on this project, Pace certainly deserves the accolades.” Cambridge was able to showcase their full-service abilities on this part, providing everything from early supplier involvement, die casting, machining, anodizing, assembling and part packaging to be delivered to L3 Technologies. We always strive to be the highest quality supplier to our customers and this is an example of the processes that we can perform. Cambridge Division excels in serving niche and specialty markets, by expertly producing difficult die castings and providing exemplary project management and engineering support. In addition, Cambridge’s value-added services includes a spectrum of capabilities including, in-house assembly, machining, finishing, and creating a total solution provider. Situated just outside of Boston, the Cambridge Division is prepared to serve the innovative customers and countless startups in the area and all over the world. For the past 45 years, the North American Die Casting Association (NADCA) has sponsored the International Die Casting Design Competition where they recognize, reward and publicize the outstanding casting designs of the year. This annual competition provides a competitive environment where submitted parts are judged on four equally weighted criteria, ingenuity of casting/product design, overall quality, cost savings and market-expanding potential. The competition is broken down into several categories by both weight of castings and material used. Pace Industries is no stranger to this competition, in the past 10 years, 6 divisions of Pace Industries have brought home a collective 12 awards. Pace has shown its expertise, by taking home awards in multiple different material and size divisions of the competition. This year we are proud to announce that we have yet again brought home 2 awards from 2 of our divisions. We are excited to celebrate with the Grafton Division on their winning part for the Aluminum casting 10lbs and up division. The Grafton Division submitted a part cast out of 413 aluminum as their 2017 choice, the 44 lb. LED Light Fixture for Cree, Inc. This part was designed to increase the illuminated area by adding extra LED’s into the larger housing. What makes this light excellent is that the part not only maximizes its size, but also minimizes wind load requirements and reducing the overall part weight, helping to make the installation process much easier. This part delivers many benefits such as reducing energy requirements, reduced maintenance cost and easier installs, allowing for rapid return on investments. The Grafton Division is an industry leader in complex high pressure die castings primarily for customers in the automotive, lighting, large and small engine industries. Grafton can provide many value added services in house including machining, painting, polishing testing and assembly to name a few. Pace Industries is committed to providing uncommon solutions that contribute to the success of our customers. On June 7th, Pace Industries attended the Upper Midwest Design2Part Show in Minneapolis, MN. The Design2Part Shows are a collection of trade shows that specialize in connecting engineers, product designers and manufacturers to some of the country’s top suppliers of custom components, parts and manufacturing services. This event was one of the 11 shows that will be put on this year all around the US. The team from Pace Industries provided 50 years of experience in industry sales and product engineering and design which showcased the breadth of our company. The divisions represented all the materials Pace Industries specializes in, making Pace one of the most diversified suppliers there. We had Sales Managers from our Minnesota-based locations of St. Paul Division, specializing in Aluminum Die Casting and the Product Tech Division, which specializes in Magnesium Die Casting. The team also included Sales Management from the Arkansas-based B&C Division, one of our two Zinc Die Casting facilities, and Port City Custom Plastics, our only Plastic Injection Molding division located in Muskegon, Michigan. This annual show is a favorite of Pace Industries and attracts potential customers Pace is eager to work alongside. We visited with folks from a cross section of industries such as; Medical Devices, Lighting & Electrical Components, Meters & Industrial Controls, and Lawn & Garden. Pace has decades of manufacturing experience, product development and design expertise to serve these and other industries so it was a great opportunity to see new and exciting products. Product Tech Sales Manager, Jim Hegland, had this to say about the show, “I feel this show captures more of the type of engineer who we like to meet. People who are designing new parts and are out searching for new ideas.” Our sales managers came to the show with a desire to reach new markets and meet new potential customers. David McWilliams from B&C, spoke on how the team worked together, “We have a great team, with knowledgeable people from Aluminum, Magnesium, Zinc and Plastics, we were able to provide information to the visitors that guided their initial material decisions (whether it be aluminum, zinc, magnesium, or plastic) which in turn helped all of our businesses.” Our sales managers walked away with many good qualified leads, while also laying a foundation with several new potential customers. Hegland said it best, “The way I look at it, if you get one deal out of a show like this, it was a home run” looks like Pace may have hit a Grand Slam. Please check out Pace Industries’ booth at these upcoming Design2Part shows in Marlboro, MA (September 27th – 28th) and San Diego, CA (November 15th – 16th). If you would like more information on how these divisions could further serve your needs, you can learn more about each division below. Port City Division (PCD), a division of Pace Industries, has long stood as a well-respected Aluminum Die Cast supplier to a majority of the automotive industry. In 2000, they established Port City Custom Plastics (PCCP), hoping to further serve their current customers through plastic products. Specializing in plastic injection molding, PCCP quickly found their niche within their automotive and recreational vehicle customers that PCD had already served with aluminum products. Plastic seems to be a popular trend in many industries right now, as many customers are looking for an economical advantage. PCCP gives Pace Industries the opportunity to support those customers who are looking for that advantage by providing plastic injection molded products. PCCP also compliments the die casting locations by providing overmolding options, a task that used to be outsourced that can now all be handled in-house further serving the customer. PCCP quickly grew working side by side with the die casting operations which allowed PCD to better serve their customers. PCCP specializes in over 12 plastic materials utilized in various applications. Almost 20 years later, PCCP has expanded into many new industries. Along with automotive they now serve the appliance, office furniture, roofing, and industrial control industries, and are seeking opportunities to serve new industries. 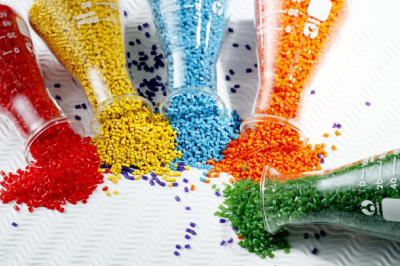 Seeing the potential for growth, PCCP has begun to equip themselves, first by hiring a new sales manager who is dedicated to the growth of PCCP, secondly specializing in over 12 plastic materials, with nylon, polypropylene, HDPE, LDPE, Acetyl, polycarbonate, and PBT, being a few. PCCP has continued to see success in the fast-changing automotive industry. This industry pushes design to the limits, looking for parts that are lighter but stronger and at the same time thinner yet still safer, and often the responsibility of creating these innovative parts becomes the job of the supply base. This is when PCCP thrives, being able to respond to industry needs and produce parts that are significantly lighter than their metal counterparts. PCCP has continually provided improved product quality for customers who are looking for those weight reductions and better product longevity. PCCP has expanded into several new industries including appliance, office furniture, roofing, and industrial control industries. PCCP has also found success in the roofing industry. Many homes in the northern states have roofs that are reinforced with ice/snow supports, which have in the past been made of steel. These parts would cost customers nearly $25 per piece. The engineering expertise at PCCP designed plastic pieces that would not sacrifice on strength or longevity of the parts but were priced around $10 or less per piece. Additionally, the plastics could easily be colored to match the varying roof colors. Not only did PCCP improve the quality of these products, but helped to reduce the cost. PCCP is located in Muskegon, Michigan along with the other PCD die casting facilities. This location has proven to be very strategic whether it be for the home construction industry, or being a few hours outside of the automotive capital of the world, Detroit. Being positioned in the Midwest provides a logistical advantage to PCCP and provides improved logistical expenses. PCCP plastic injection molding products are made to the highest industry quality standards. PCCP has quickly grown into an integral piece of Pace Industries, and gives us countless opportunities to further serve our current customers and to broaden our reach to new ones. We believe that PCCP helps give us a competitive advantage over our competitors and we know that PCCP can help you to achieve that same advantage. If you have any questions or would like more information regarding Port City Custom Plastics or Plastic Injection Molding, please reach us here. Scott Bull (left), President of Pace Industries, accepted the Northark Board of Trustees Partnership Award on behalf of Pace Industries during the Northark Graduation Ceremony from Jane Adair, Chairman of the Board. 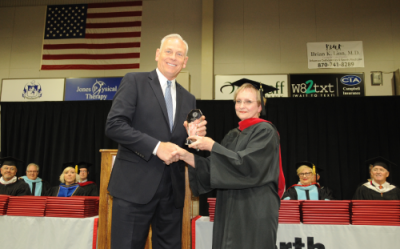 In recognition of our years of cooperation with Pace and Harrison’s Northark College, Pace Industries was presented with the first Northark Board of Trustees Partnership Award at the school’s commencement ceremony on May 6th. Over the years, Pace and Northark College have cooperated to support one another in their endeavors, strengthening both the relationship of the organizations and their ability to service their students and clientele. Northark has even developed customized workforce training and specialized class offerings to help train more skilled workers for Pace’s operations. When these classes needed equipment to provide the best possible training, Pace donated and installed a $150k die cast machine at the school. Many Northark graduates from these classes went on to join the Pace team, with the graduates’ specialized training improving the quality of Pace’s work nationwide. (From left) Steve Kruse; Kevin Roberts; Dr. Rodney Arnold, Northark VP for institutional advancement; Justin Rummer; Cheryl Goodman and Nell Bonds, dean of community education & workforce development at Northark. 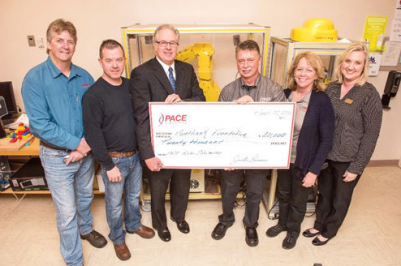 Pace and the Northark Foundation have worked together to establish a scholarship to assist manufacturing technology and industrial electronics students with their tuition. Each year, Pace donates $20,000 to support aspiring manufacturing professionals and foster job growth in the Harrison community. “Pace has been such a good friend to this College over the years. The board felt the time has come to recognize their contributions by creating an award to recognize the vital importance of our business and industry partners,” said David Evans, Chair of the Award Committee and Northark board member. It’s not only in Harrison that Pace is working to improve education within the community. Pace is partnering with 70 high schools and technical colleges nationwide in an effort to educate students and be a community leader in those locations. Patterson Division (in St. Charles, MO), along with other industry leaders, sits on several advisory boards for many of Ranken College’s programs. Industry leaders look to hire as many Ranken students as possible. 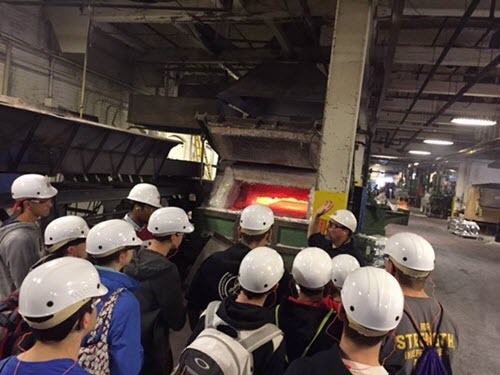 Student tours are constantly coming through the plants so that students can connect classroom theory with real world experience. At our Product Tech Industries Division, Pace works with Wright Technical Center in Maple Lake, MN. Their partnership is one that supports students’ desire to explore career opportunities through state registered youth apprenticeships. Students are able to work at PTI and gain school credit, while earning a good wage for their efforts. Pace’s long-term goal with school involvement is to show students that advanced manufacturing does not happen in dark, grimy buildings, but in places that make use of new technologies and skills that translate into rewarding, lifelong careers. Pace is looking to usher in a new generation of leaders in advanced manufacturing. Proud to be the first to accept this award from Northark, Pace is committed to growing and maintaining our participation with the college. This kind of acknowledgement from partners and clients keeps us confident that we’re fulfilling our mission to provide the highest quality in casting and manufacturing. Scott Bull addresses the crowd at the NorthArk award ceremony. Lightfair 2017 is just around the corner, with the 2017 event being held from May 9th to the 11th at the Pennsylvania Convention Center in Philadelphia. Lightfair 2017 will play host to members of the architectural and commercial lighting industries, as they meet to learn about new solutions, knowledge and discoveries in lighting. A hot topic at Lightfair 2017 is sure to be LED technology, with improvements to the technology a focal point of discussion. Pace is excited to attend and learn more about the technology. One of Pace customers’ primary concerns is to dramatically reduce lead time to market. With LED technology improving so rapidly, the lighting company able to bring that new LED technology to market first, will dominate. Pace is assisting customers on the front end, with early supplier involvement (ESI) in the engineering and design of LED castings. By also getting designs to be die cast friendly, reducing their weight, and making them as cost-effective as possible, Pace is meeting customer demand. By addressing these concerns at the beginning of the process, Pace can generate a quote faster, get their tool shops involved quicker, and reduce the lead time to build new tools. This is enabling customers to get their product out into the market faster than their competitors. While Pace will not be showing at Lightfair 2017, they will be present to meet with industry experts to learn about advances in the lighting industry, and what role they will play in the future of lighting. Stay tuned for what they learned at the show. Pace’s Port City Division was recently awarded a Certificate of Achievement at Toyota’s Supplier Conference. A casting division of PCD supplies Toyota with the vacuum pump bracket used for the hydraulic brakes in the Toyota Tacoma TRD Off Road package. The certificate was awarded to PCD for achieving a 100% on-time delivery rate and a zero PPM defective for the year of 2016. A PPM (Parts per Million) score relates to the number of parts per million that are defective. If a supplier produces 10,000 parts and just one of those parts is defective, that supplier has a PPM of 100. PCD was responsible for production of over 30,000 parts, a relatively small number, but achieved a PPM of zero. While many other companies avoid taking on smaller production volumes, PCD was able to deliver these parts with a zero PPM, while remaining 100% on time. Being on time once is easy. Being on time thousands of times, across all areas of production, throughout an entire year is a difficult task without doubt. In 2016, PCD not only met Toyota’s strict production requirements, they did it on time every time. Being on time saves the customer downtime, money, and in the end, cultivates a sense of trust between supplier and customer. When a customer knows they can depend on the supplier, they don’t need to look elsewhere. Not only is PCD responsible for the casting of the part, they also provide secondary machining and assembly for the vacuum pump bracket. PCD machines the part, inserts a gasket (assembly), and then pressure tests the assembly to ensure the highest quality and functionality is being delivered to Toyota. With Port City Division able to offer these secondary operations, they provide an added value to their customers. While competitors may only supply the raw casting, PCD goes above and beyond to ensure that whatever they produce is being sent to the customer when they need it and how they need it. The secondary operations for this part include machining, blast finishing, assembly, and pressure testing. This award from Toyota stands as a testament to the Port City Division’s uncompromising commitment to excellence, upholding the values of Pace as a whole. By accommodating all processes in-house, PCD helps Toyota optimize their total cost by providing an end to end solution, saving time and money. At PCD, our culture of zero defects and exceeding our customers’ expectations ensures that partners like Toyota remain just that. Ever since it was founded in 1970, Pace Industries has been committed to providing uncommon, creative die casting and support solutions to their customers. While our goal has always been the same, the tactics for achieving it have understandably changed, especially when looking at the last 20 years. Flow analysis – shows the flow pattern during die cavity fill. Reveals temperature, pressure, and velocity. Thermal analysis – shows how the metal solidifies within the steel die. Thermal stress analysis – shows how the castings distorts as it cools after being removed from the die. Finite element analysis (FEA) (added in 1998) – analyzes high stress areas in castings which can be used to improve strength of future castings. We often have a new cast tool running with changes implemented within six months of studying insights from the analyses. Thanks to research done by NADCA, we began to understand how to optimize die steel performance in the casting process. This was information that affected our language when communicating with customers about the length of die life. We took the research and successfully applied it to our process in the late 90s. How successfully? Well, prior to that, several of our tools were suffering premature failure yearly. Since that implementation, there hasn’t been more than two failures in over five years. High elongation aluminum alloys – for use in thin-wall structural applications. This plays a major role in helping reach mandated fuel efficiency levels for automotive companies. Specialty aluminum alloys – allows the die casting process to compete with other aluminum processes that standard die castings cannot meet. We are devoted to making sure we are using the most efficient technology, and our increased use of automation has led to some groundbreaking developments. In 2013, we began to use dosing furnaces that led to energy savings, and in 2002, we saw emphasis on the use of robots. There was a learning curve for our associates during this time, with many requiring training on the new methods, something that was surprisingly enjoyable. “Most of our people enjoyed the training because it was a challenge, and several requested to work with the robots,” said Arnie Fulton, vice president of engineering. In early 2004, we began to examine the best design that would lead to increased energy efficiency and melt rate. In five months, we had reached our goals by improving insulation, improving refractory, and applying a new burner design and molten metal pumps. 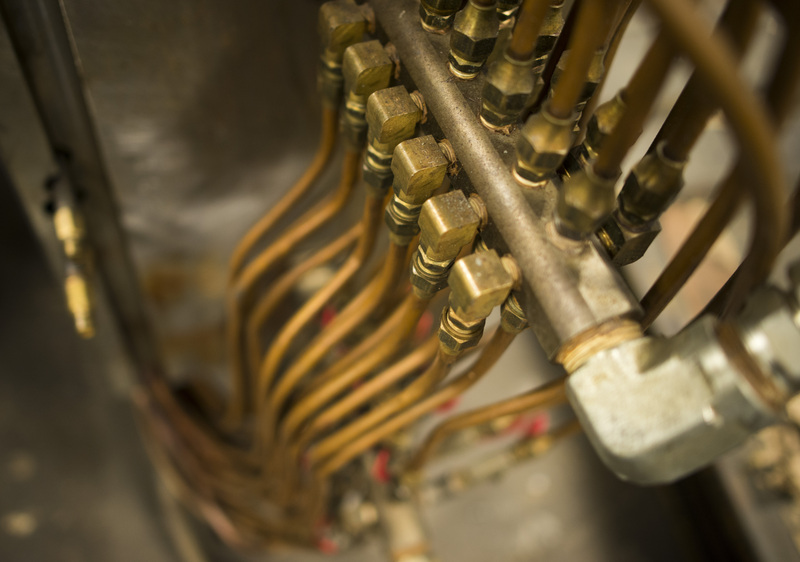 In the time since, we have built approximately 15 more furnaces, all using the same effective design as that first one. In 2015, customer needs required bigger machines than what we had. To continue to best serve our customers, we worked to acquire machines up to 3,000 tons, when our previous leading machine maxed out at 1,800. This change maximized satisfaction and allowed us to foray into new areas such as alternate alloys. The past 20 years have brought tremendous growth to our company, our associates and our customers. But we aren’t stopping. We are excited about what will come in the next 20 years. Located in Muskegon, MI, Port City Division is the newest addition to Pace Industries. Pace and Port City Division merged operations in July 2015, with great enthusiasm for many reasons. A unique characteristic of this new facility is that it is comprised of several locations – six fully-integrated companies. This division includes four die casting plants, custom plastics manufacturing and specialty tooling. Through Port City Division, we are proud to not only continue serving the automotive industry, but we also offer capabilities to the recreational vehicle, meters and lawn & garden industries. No matter who the customer is, we insist on beginning our relationship by assigning them an engineer who will be present during each cycle of their project. Because of this consistency in personnel, we can reduce time and cost for our customers. Pace Port City Division specializes in full-service supply chain management and providing tooling design and management to customers. Boasting 31 die cast machines, our capabilities include high pressure die casting, complex machining, plastic injection molding, tooling, rapid prototyping, and product design and validation. The products we create range in weight from .05 to 20 pounds. We have a wide range of tools at our disposal, which is what allows us to produce such a variety of products. We successfully work with flow analysis, thermal analysis, nanotechnology and several other in-house tools. Mirror Image Tool is the specialty tooling company that offers design and construction of secondary machining equipment as well as inspection equipment. A capability we are particularly proud of is producing complex parts sensitive to specific porosity and cosmetic requirements. It is a task we are good at and, therefore, are often asked to do it for customers. Once we have confirmed that we have supported design work, we efficiently make these delicate parts. To exceed the expectations of the customers we serve, PCD has a strict Quality Management Systems in place that we are deeply committed to. 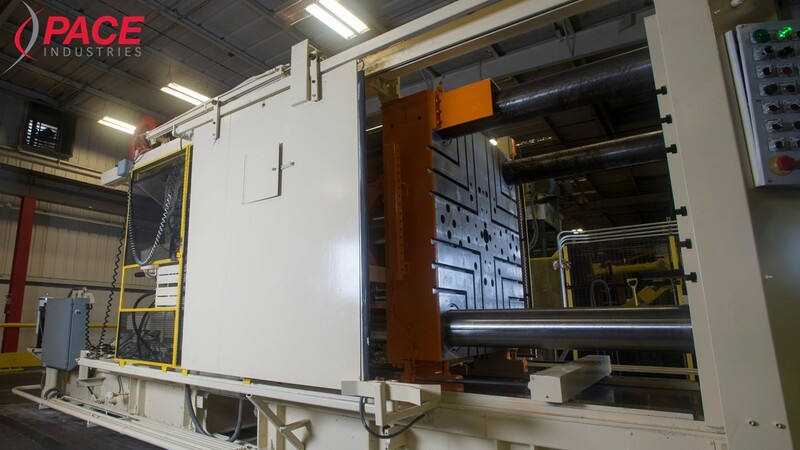 Whether we are manufacturing aluminum die castings, mechanical assemblies or injected mold plastics, the promise to our customers is the Pace Advantage of delivering the highest quality products in the most efficient amount of time. Business Excellence is Pace’s systematic approach to identifying and eliminating waste through continuous improvement and making products that meet our customers’ needs. As its director, Bill Turner is focused on the company’s wins, as well as the growth opportunities that become apparent after setbacks. Strategy Deployment (SD) is a structured process that motivates us to work on those things paramount to the success and longevity of our business, including safety, quality, delivery, inventory and cost. It has been an integral part of our business for 10 years. In 2017, SD will continue to be key in helping us achieve a compelling competitive advantage. Associates from all levels of our company participate on multi-functional teams to achieve the goals established through this process. From there, teams are empowered to develop and execute action plans, measure progress and resolve problems. Through this, we build a culture of continuous improvement through associate engagement, teamwork and problem solving. This year provided evidence that this strategy is positively affecting our work. In 2016, there were several new product introductions across the business, many of which were in the automotive industry. Serving this industry’s customers can be a challenge due to the complexity of the parts and their stringent quality requirements. Despite those difficulties, in 2016, we improved our parts and customer satisfaction significantly increased, allowing for a growth in the automotive segment of our business. Our quality was better though the work was more complex. We consider this a great success story! So where is Business Excellence going in 2017? First, we will reinforce our commitment to SD by engaging even more associates in the process. 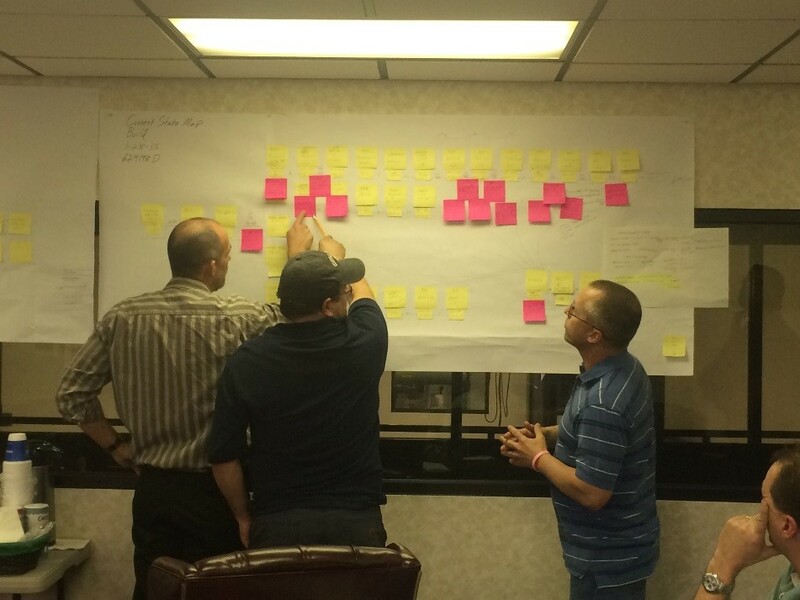 Second, we will be expanding the utilization of ongoing improvement methodologies and tools, including value stream mapping, 5S, standard work, poka-yoke, SMED and kanban. We need to take advantage of these proven improvement techniques. And third, we will remain diligent problem solvers. In 2017, we will be relentless in our pursuit of achieving a compelling competitive advantage. 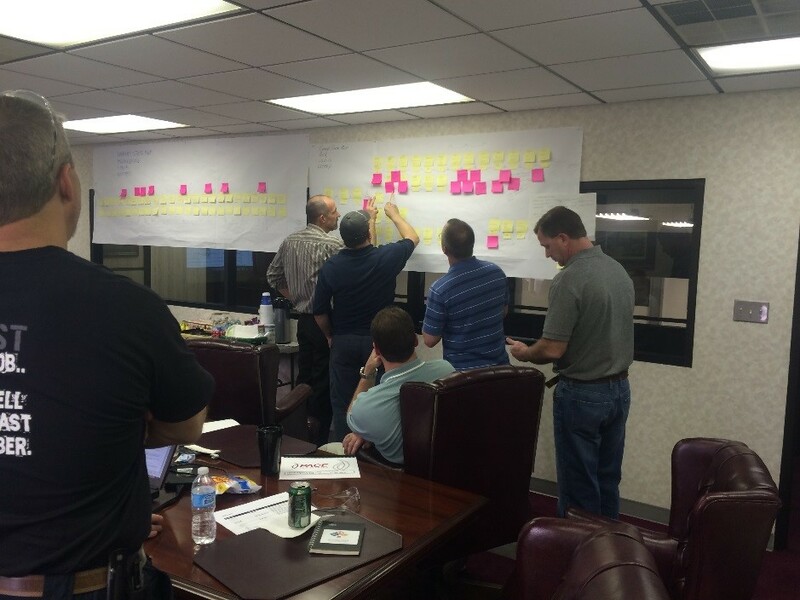 A team at Mangas Tool & Die complete a value stream mapping exercise as part of Strategy Deployment. As 2016 comes to a close, everyone is inevitably curious about what the new year will bring. Arnie Fulton, Pace’s vice president of engineering, provided insight on manufacturing trends that will influence the company strategy in 2017. Automation Continues – Collaborative robots are a trend that has received a lot of attention in industry publications. The great thing about these robots is that they are designed to work alongside our associates. We have found they are easier to program and safer to use than conventional robots. Pace will continue to implement automatic equipment, and our main focus will be on the further utilization of collaborative robot applications. Larger 3-D Printing Presence – Pace dabbled in 3-D printing this year, but we really want to grow that over the next 12 months. The trials completed this past year have been quite successful. We’ve used 3D printing for both die components and machining fixtures, and we will be expanding to castings next. Focused on Thermal Control – One of our goals for 2017 is to delve even more into the process of controlling the die temperature for the purpose of improving the quality of die castings. Further understanding of the thermodynamic process will result in an improved consistency, which will lead to an improved product. Integration of Laser Manufacturing – Laser manufacturing is not new to Pace Industries, but there is opportunity for it to continue to evolve and become more integrated throughout our company over the next year. We are currently in the process of researching and developing its use within our facilities, and the goal is to complete that research in 2017 so we can begin implementation. As a company, we are eager to incorporate laser manufacturing into a variety of functions, including the repair of tooling and machine components, extending the life of casting dies and even fabricating new parts for increased performance. Given that we pride ourselves on exceeding expectations with our work, it is no surprise that our 2017 objectives reflect constant improvement in areas we are familiar with. We are dedicated to achieving and excelling at these upcoming trends, and continuing to identify new areas for opportunity. That is how we will remain dedicated to providing uncommon solutions to our customers in 2017 and in the many years to follow. This is our Product Tech Division in Maple Lake, MN. Pace Product Tech Division is an integrated magnesium resource for product development from concept to solution. 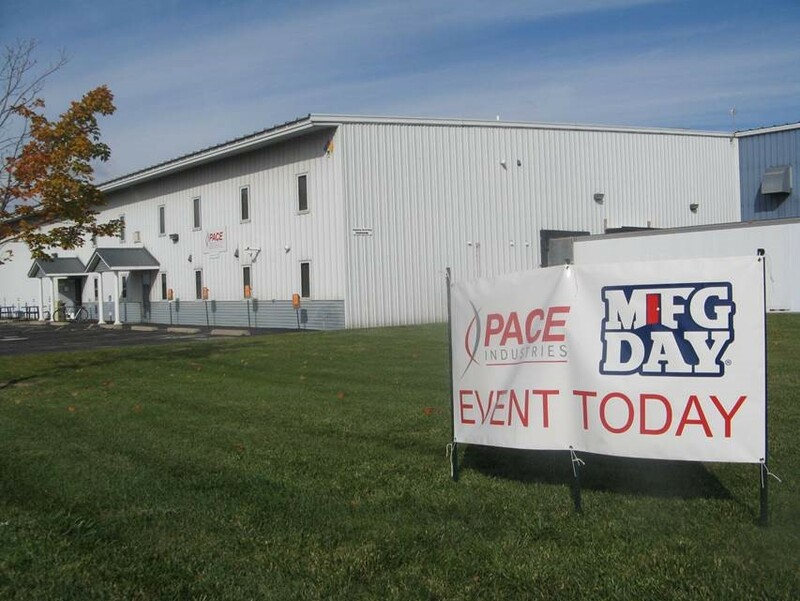 Here at Pace Industries, we recognize the importance of being passionate about your work, which is why we participate in Manufacturing Day. For three years now, we have invited students into several of our production facilities to give them a glimpse into modern manufacturing and to inspire them to pursue it as a career. 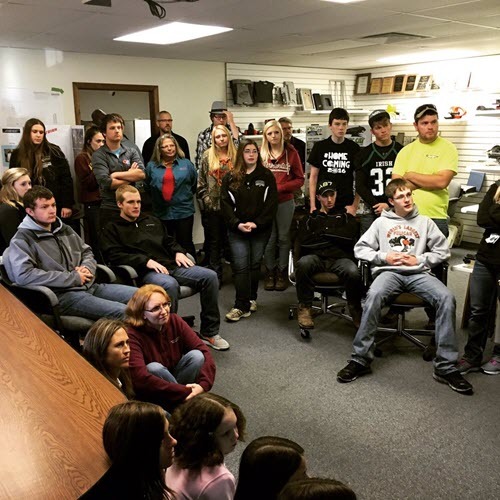 This year, we had a total of 1,228 students visit Pace Industries during October. Attendees ranged from 7th grader through college-aged students. 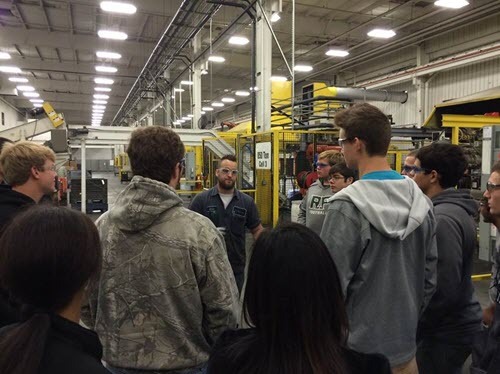 Each Friday in October, at least one of our facilities held a Manufacturing Day event. The Harrison Division hosted two days due to the high volume of students involved in the area. Ethan Robinson, our workforce coordinator, is responsible for connecting with schools and confirming their participation. “I contact about 75 schools in the United States, including technical schools, universities and high schools,” said Robinson. This is Robinson’s second year coordinating Manufacturing Day, and his learnings from 2015 helped shape his plans for 2016. “Last year, we really focused on the products that we made because we wanted to awe the students,” Robinson reminisces. “After talking to them last year, we learned that what they want to know about is careers.” With that knowledge, he decided to revamp the Manufacturing Day material to be more job-focused. During the students’ visit, we chose to highlight positions that we predict will be in demand when they are completing school and entering the workforce. 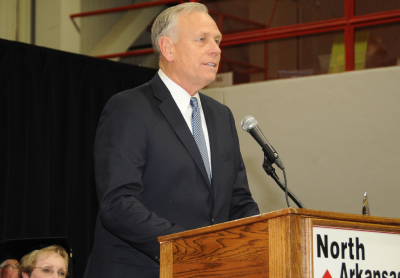 “We’re looking to get the word out to let kids know manufacturing is a viable career path,” said Robinson. Robotics is becoming a more prominent part of the industry so there is a lot of encouragement to pursue some kind of automation training. During Manufacturing Day, students go on a plant tour in which they are able to see every part of the facility and learn about the different machines we work with. Afterwards, they are given the opportunity to ask associates questions they may have about the work and career opportunities available at Pace. When they leave our facility, we hope they walk away with useful information about careers they may have not formerly considered as well as how to pursue them. Bob D’Ortona, vice president at our Cambridge Division in North Billerica, MA, gives a tour to students from Shawsheen Valley Technical High School. They are looking at an Aluminum melting furnace with 20,000 pound capacity. 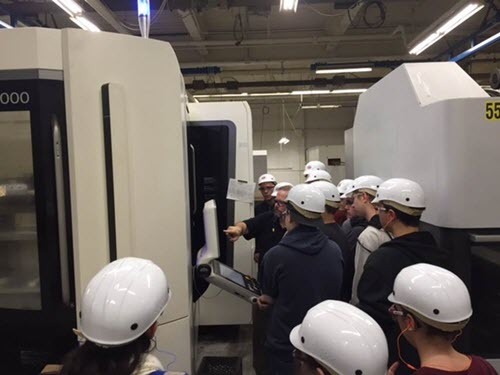 Lee Kittle, die cast manager at Pace Industries, Port City Division in Muskegon, MI, hosts students from the Muskegon Area Technological Center. He is showing them an 850 ton die cast machine. 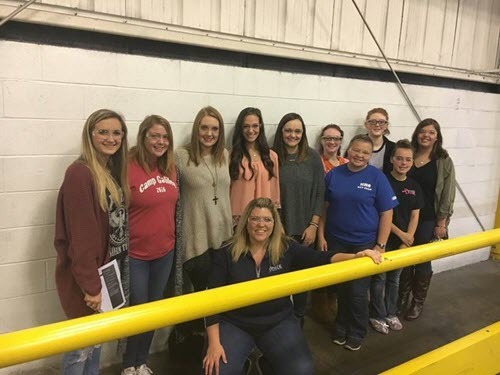 Hannah Niblett, talent sourcing specialist, poses with a group of Harrison High School students at our Arkansas based Harrison Division. Bob D’Ortona doing tours with one of our QC engineers, Anne-Marie Buchenan. They are discussing and viewing a Mori Seiki NHX 5000 horizontal machining center. 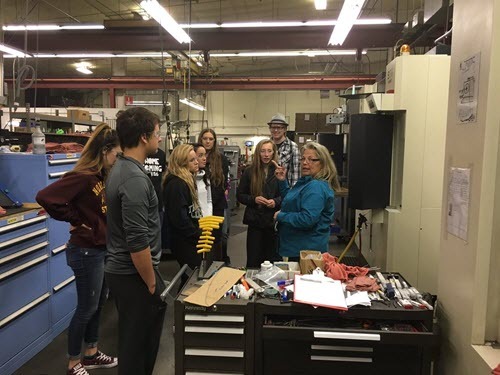 Product Tech Division – Lynne McIntosh, safety manager, shows Maple Lake High School students the S56 Vertical Machining Center in the tool room. Product Tech Division – Homeschooled students and some from Maple Lake High School listen to a presentation about our products, career opportunities within Pace and educational paths they should take for those careers. This month, we continue to celebrate Pace Industries’ wins at the North American Die Casting Association’s (NADCA) International Die Casting Design Competition. We are recognizing our Saltillo Division for their victory in the Aluminum Die Casting category for parts weighing 1-to-10 pounds. Alfonso Carillo, sales manager at the Saltillo Division, thought carefully about the product his team would submit, ultimately deciding to showcase the complex high-bay LED heatsink. 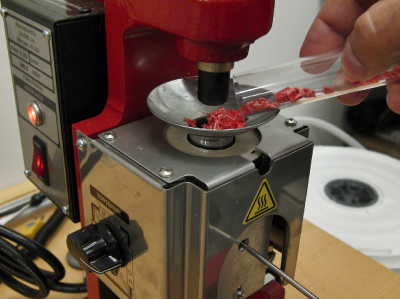 “This is a heat dissipater, which is usually a challenge for a die caster,” said Carillo. The high-bay LED heatsink is made to be used in warehouses, or other structures with high ceilings. Because LED lights generate a considerable amount of heat, the heatsink’s function is to help dissipate heat and help lights cool down. The development of the LED heatsink has been quite a journey, and we are happy that we were given the opportunity to become involved and active in its later stages of production. The Saltillo Division began working on the part with our customer, Cree, in 2015. When they brought the design to us, we knew that it was a great product, but could benefit from some changes. In collaboration with their design team, the Saltillo Division further enhanced the LED heatsink and worked to improve the functionality. By early 2016, we were able to provide a better solution for the customer that eliminated several components which resulted in a high level of heat conductivity. Nelson Lui, senior mechanical engineer at Cree industries and the original designer of the part, is both surprised and excited about the recognition that the heatsink has received. “I understand this component is not easy, but Pace has good engineers,” said Lui. He and his team worked hard to develop this part, and he was always grateful for their support and professional advice. This open exchange has also existed in our relationship with Lui. “I had never thought of the modifications before, but after they mentioned it, I was confident about the changes, although it is our most complex part.” When he was consulted about granting permission to enter it for a NADCA award, he had no hesitations. Our relationship with Cree has been active only since January 2015, but Lui believes in the future of our collaborations. 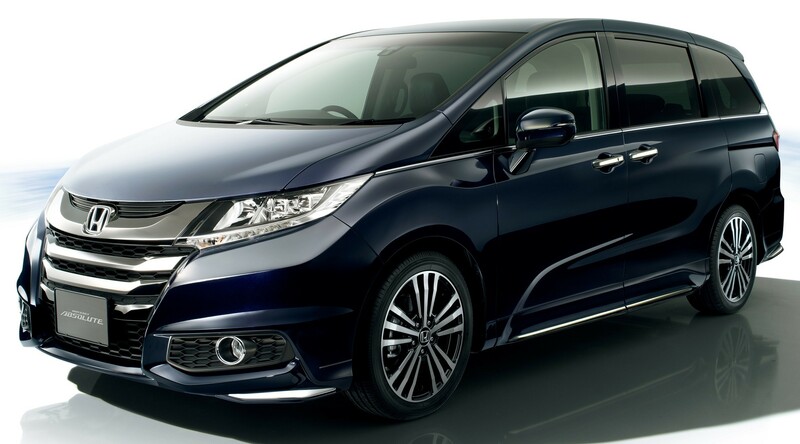 A 2016 Honda Odyssey, which includes the winning part from Port City Division. A new experience is where growth happens, and it is a bonus if success happens on your first attempt at it. That is exactly what Port City Division accomplished last month when we entered the North American Die Casting Association’s (NADCA) International Die Casting Design Competition. This was our first year to submit an entry, and the risk paid off when we took home the prize for Best Aluminum Die Casting Under One Pound. The annual international competition, held the last 43 years, promotes increased use of die castings through the recognition of outstanding designs. The competition showcases outstanding die cast designs, while acknowledging the continuous contribution die casters provide to the manufacturing industry. Entries this year came from the U.S., Canada and overseas. Some of the additional winners were from Italy and Austria. Each entry was judged on its ingenuity of design, quality, cost savings and industry-changing potential. Winners are featured in national industry magazines (including Die Casting Engineer) and are displayed at the 2016 Die Casting Congress & Tabletop. Pace’s Port City Division won in the aluminum category for our side mirror inner base, manufactured for our customer Magna Mirrors. This innovative design differs from methods previously used to attach side mirrors on cars, most notably by minimizing post processing and eliminating a machine operation. This gives our customer a distinct industry advantage. When deciding what parts to enter, we looked at several unique parts that Port City Division has developed and agreed that we should pick something that gives our customers a commercial advantage or that solves for an existing problem. We are proud of our side mirror inner base part and the recognition it and our team members have received. It serves as an excellent example of our continuing and unwavering commitment to providing creative and uncommon solutions. We look forward to competing again in the NADCA awards. It is an excellent way to showcase our everyday work on a grander scale. Our top priority is, and always will be, the manufacturing of innovative and quality products that we take pride in. And a satisfied customer is always the biggest reward. However, there’s no denying that being labeled a winner is also a nice perk. 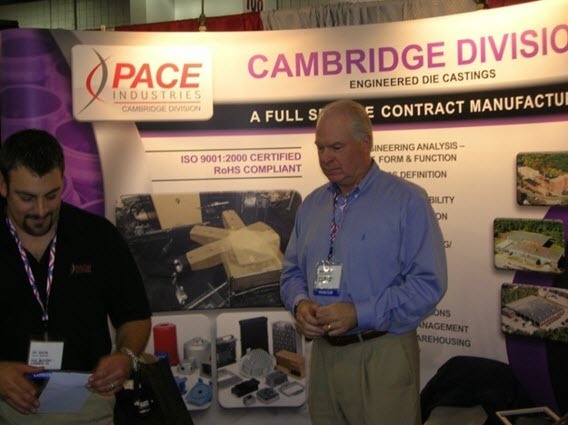 For the past 24 years, the Pace Industries Cambridge Division has participated in the regional Design-2-Part (D2P) show. As our mission statement proudly states, we are always seeking opportunities to provide uncommon, creative die casting and support solutions for our customers. Here at the Pace Industries Cambridge Division, we pride ourselves in serving niche and specialty markets with our complex die castings and engineering support. As Northeast sales manager Jeff Martin puts it, “We provide uncommon value in the market niches we elect to serve.” Those who have worked with Pace Cambridge are aware that low volume, highly complex projects, such as sub-assemblies, is where this division thrives. This show is a chance for us to increase visibility with those who have not discovered us yet. On September 28 and 29, the Pace Industries Cambridge Division participated in the regional D2P held at the Royal Plaza Trade Center located in Marlborough, Mass. The more than 1,800 attendees were able to see both custom and stock parts, components and services from over 300 manufacturing categories. Exhibitors came from all over the country, spanning from California to Maine. Northeast Sales Manager Jeff Martin attended the show this year. He was excited to see how active the local market was, and in the two days Pace Cambridge was present, we feel great about the connections we were able to make. Located in Arden Hills, Minnesota, the St. Paul Division of Pace is proud to produce aluminum die castings for complex, difficult-to-fill parts with a focus in flash-free, net-shape production. From concept to solution, our high quality approach ensures that all the aluminum die cast components meet exact design specifications and are delivered on time and within budget. With 11 aluminum die cast machines, this division of Pace Industries specializes in providing custom alloys and machining for a diverse customer base, including the medical equipment, aerospace, recreational vehicles, instrumentation, automotive, defense, and motors and industrial industries. As a TS-certified and ITAR participating facility, we offer value add services, including full in-house product assembly to alleviate time and space constraints for customers. Additionally, we are committed to transforming our customers’ concepts into functional die casting solutions through the utilization of tools such as flow analysis, thermal analysis, computational fluid dynamics and nanotechnology. When we deliver our final products, customers know they’re getting top quality work that is the result of the latest die-casting technology, rigid standard of performance and the pride of remarkable workmanship and outstanding service. We invite you to learn more about the St. Paul Division on October 14 as we celebrate Manufacturing Day. We’ll open our doors for tours of the facility, as well as a presentation about Pace Industries and some of the products manufactured here. Please contact Ethan Robinson at Ethan.Robinson@paceind.com if interested in attending. We look forward to seeing you there! Pace has been an innovative company since its inception. It’s the basis of our corporate mission statement: provide uncommon, creative solutions, which contribute to the success of our customers. So it’s no wonder we’re leading the industry in technological advances, such as using collaborative robots on the manufacturing floor. Collaborative robots, which are also called “cobots,” are designed in a way that allows a robot to physically interact with humans in a shared workspace. This differs from a conventional robot in that they don’t require a safety enclosure to operate. Cobots work at full-speed without jeopardizing safety. Why are they used in manufacturing? In addition to their safety features, Pace is interested in cobots because they’re affordable, highly adaptable and easy to use. Most of them operate from a smartphone or tablet, so they don’t require a high level of expertise to set up and program compared to conventional robots. This means they can be put into operation quickly and easily. And since they’re generally simpler than traditional robots, cobots are more affordable to maintain. These robots are also highly efficient. When partnered with an associate, they produce an end result better and faster than either could do working alone. In fact, tasks that normally take days can be completed in a single shift. How are they being used today? Pace is still in the early stages of implementation. Right now we’re using them to perform repetitive operations, such as sanding of castings. We’re also using them in the process loading and unloading CNC machines. Having them in this capacity allows more time for a person to perform other value-added operations that require more skill. Since they’re relatively lightweight, cobots can be moved from one work assignment to another. Because of this benefit, we’re looking at many other applications in die cast machine applications. What’s the benefit to customers? While there are multiple benefits to Pace, collaborative robots also benefit customers. They allow us to provide higher quality products while keeping costs in check. For example, when they’re programmed to work with CNC machinery, we can offer a more finished product. This eliminates having to send it out for additional steps in the process. Keeping everything in-house reduces costs and increases quality. There will continue to be applications where it makes sense for associates to perform tasks manually. And some applications require overall automation to keep costs down and safety at a maximum. Cobots are proving to be the best solution for tasks that fall somewhere in between. We believe there’s a growing need to integrate robots into the workforce to take advantage of the diverse strengths of both humans and robots. So Pace will continue to explore and implement more robots where they fit best in our processes. We’ll keep our focus on uncommon, creative solutions for the success of our customers – always. 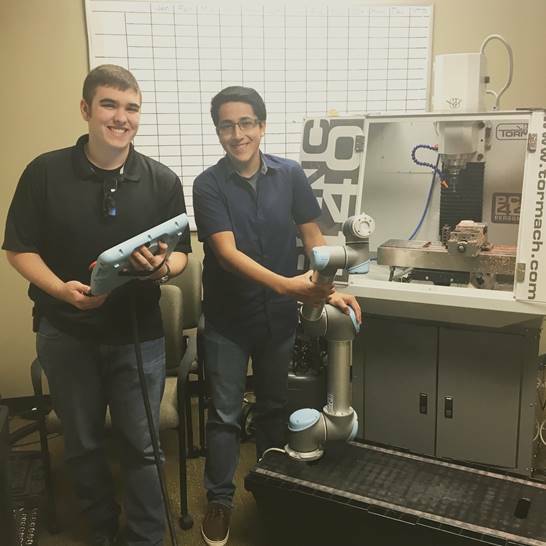 Juan Zuniga and Noah Wehn, both seniors at HarBer High School in Springdale and summer interns at Pace, used their skills to integrate a collaborative robot with a CNC machine. The Cambridge Division, located in North Billerica, Mass., is one of Pace’s longest-running facilities. Founded in 1945, Cambridge has been providing contract manufacturing die casting worldwide for more than 70 years. Three facilities with over 300,000-square-feet combined space provide a large environment for expert manufacturing services. Cambridge focuses on value-added services, producing higher-end components and serving a number of different industries. This particular division excels in serving niche and specialty markets by expertly producing difficult die castings and providing exemplary project management and engineering support. Taking it a step further, Cambridge offers in-house product assembly, machining and finishing to create a total solution. The division is also ideally positioned to serve design houses that assist innovative customers and start-ups in the medical, aerospace, instrumentation and defense industries. Recently, the Cambridge Division was selected by Civiq Smartscapes as the mechanical manufacturing partner for Link NYC. Link NYC is like an iPhone for the street. 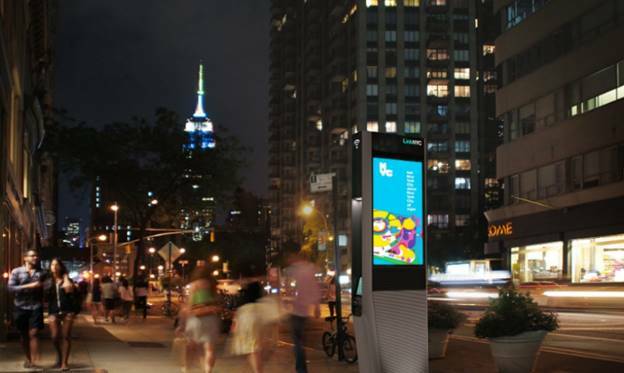 It’s the first of its kind and serves as a public access Gigabit Wi-Fi hub providing free Internet access to New York City. NYC is just the first municipality to adopt the Civiq Smartscapes solution. Through our Cambridge Division, Civiq Smartscapes is able to leverage expertise in mechanical design, casting, machining, product finishing and assembly. Cambridge engineering worked closely with the client to redesign parts and sub-assemblies, which not only reduced costs, but also improved the final finish for superior aesthetics and durability. Interested in what we can do for you in our North Billerica location? Contact Jeff Martin or Al Parrelli. Die casting can be a tricky thing to master. That’s why at Pace Industries, our experts are here helping through every phase of the process. Pace is constantly working to provide uncommon solutions to customers, and one example is the extensive product design assistance we offer. We work with our customers on the design of their castings to incorporate features that will maintain functionality while optimizing features that enable the casting to be easier to produce. This allows our customers to receive a casting from Pace that is designed to minimize their cost while allowing Pace to minimize our production costs. Customers often know what they want functionally and we know how to make a casting that will meet those needs. Here are our top five tips that can help you understand our process and the reasoning behind the design guidance we provide. • This improves metal flow and the filling of the casting for better quality. It also minimizes dimensional variation due to the differences in cooling rates in the casting walls. TIP #2: Corner radii (outside corners) and fillet radii (inside corners) on the casting should be as large as possible. • This improves the filling of the casting for better quality and increases die life due to decreasing of the degradation of the die steel in sharp corner areas. TIP #3: Include draft (tapered walls) in the casting design. You should have more taper (draft) on the inside walls of the casting than you do on the outside walls of the casting. • Draft is required in order to remove the casting from the die. (This the same reasoning used in the design of muffin tins, which have tapered walls to aid in removing the muffins.) The reason for more draft on the inside walls is that the casting alloy shrinks as it solidifies. Castings tend to get smaller and fit more tightly onto the inside of the casting. The increased draft then allows for easier removal of the casting from the die. TIP #4: Keep critical dimensions on the same side of the die. TIP #5: Avoid undercuts, if possible. • Undercut geometry cannot be cast in a standard die cast die. 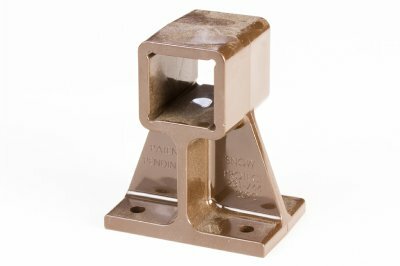 This undercut requires the addition of a moving die member called a “slide” in order to cast this piece of the casting geometry. The added “slide” increases the cost of the cast die. The undercut geometry also affects the amount of time required to make the casting, which increases the cost to the customer. At Pace, we are here to provide hands-on assistance. We can help you understand the design process and what will ultimately be the best fit for your casting needs. We also offer casting design seminars at customer locations where we meet with product design engineers in an informal, educational setting to provide a better understanding of what designs work well for die casting. Our first priority is always to provide our customers with high-quality products at competitive prices. Working together with our customers, we can help develop casting designs that satisfy functionality and castability requirements. Here at Pace, we have been producing Zinc-Aluminum (ZA) alloys for so long, hardly anyone remembers how the company even got started. We rounded up some of our smartest associates and picked their brains to learn more about ZA alloys. Here is what we do know. Developed in the late 1960s and early 1970s, ZA alloys served to fill a gap in performance characteristics between zinc alloys and aluminum alloys. There are three alloys in this family; ZA-8, ZA-12 and ZA-27. The numbers in the alloy names are the approximate percentages of aluminum in the alloy. As a comparison, the nominal amount of aluminum in standard zinc alloys is 4%. B&C Die Cast was founded in 1984 as a family-owned and operated business. The company built a reputation as a service, product and quality leader in the industry and, in 1998, became part of the Pace family. The B&C division has been producing ZA alloys for 32 years now, which provide significant benefits to the Pace customers. We are proud to produce a product with such considerable benefits to our customers. 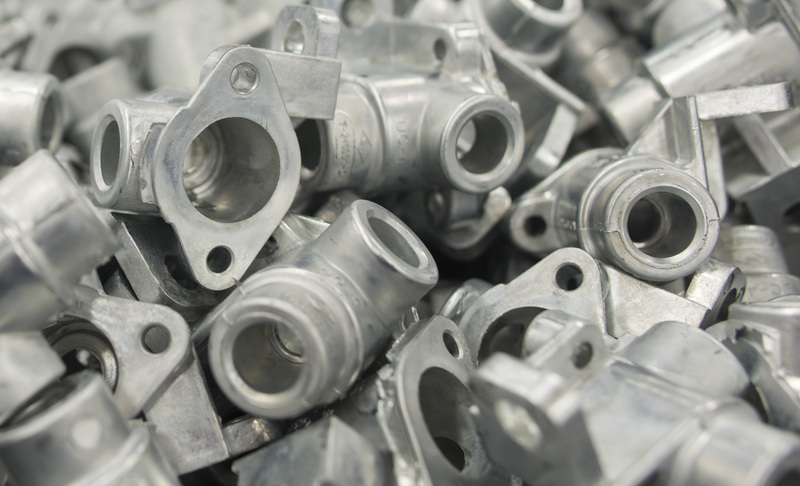 Our B&C division produces castings using the ZA-8 alloy in a hot chamber die casting process. In addition to those benefits listed above, this process saves our customers money by providing a longer die-life — compared to dies running with aluminum alloys. Another financial benefit is that dies can also be interchanged with ZA-12 and ZA-27 alloys, without the need to purchase new dies. In addition to being affordable, we have faster cycle times than standard zinc die casting, making Pace more competitive than other companies. The B&C division specializes 100% in zinc die castings. B&C also offers in-house machining capabilities and assembly to provide a variety of options to our customers. At Pace, we are committed to providing our customers with the highest-quality products to meet their needs in affordable and convenient ways. ZA alloys are just one way that we are making that happen. There’s a trend that has been growing for several years now called the Maker Movement. It’s a modern term to describe the wave of independent inventors, designers and tinkerers who are bringing their ideas to market through the use of new technology. Typical interests of a maker include engineering-related activities, such as electronics, robotics and 3D printing, which is why Pace is so interested in this movement. We’re constantly evolving in our use of technology to make the highest quality and most cost-effective products for our customers. We’re always improving our processes and strengthening our future. And one of the best ways to stay on course is to find and hire the best of this new generation of makers and give them resources to create industry-changing ideas. Throughout history, when people have the right tools and inspiration, they have the ability to change the world. That’s what we’re experiencing right now. New tools like 3D printers, laser cutters and open-source hardware, are empowering a generation who have been tinkering in their garages and basements since they were little. It’s up to manufacturers, like us, to encourage these inventors to become team members. They hold the recipe for products of the future, and manufacturers have the means to produce them and make them work. It’s the perfect partnership. So how do we encourage the Maker Movement and this generation of tinkerers to become part of a company like Pace? We invest in them and provide opportunities to explore and grow. Pace is so committed to young engineers that we have created one-of-a-kind internships for kids as young as 15-years old. We also sponsor high school robotics teams and provide scholarships to college-level students interested in manufacturing. Our ultimate goal is to transform kids’ passions for engineering, robotics and other technologies into real-world business practices. We want to give them a place to grow – and a future to be excited about. One of our inaugural programs has been an 8-week summer internship for two high school students. Juan Zuniga and Noah Wehn, both seniors at HarBer High School in Springdale, Ark., have been blazing trails since the day they started their internship with us. This is now their second summer to work with Pace. When they first started, they jumped into an automation project for our division in Harrison. While they’re too young to work on the plant floor, they were able to work with 3D modeling, grow in their understanding of the die casting process, and perform computer work that assisted in perfecting our Automation Training Center. This summer they’re using their skills to integrate a collaborative robot with a CNC machine. These robots offer multiple benefits to a plant in terms of safety and cost effectiveness. When they’re programmed to work with CNC machinery, it allows us to offer a more finished product for customers. So the projects these interns are exposed to are educational for them and beneficial to the company. In addition to working with our 3-D printers and robotics, Juan and Noah have participated in safety meetings and other day-to-day activities within the company – giving them a good sense of the business environment and making them smarter about the industry as a whole. Each summer, the internship culminates in a presentation to the entire home office that includes a summary of what they’ve learned. When asked about their experiences with Pace so far, Juan said, “Pace has offered us a great opportunity, especially for someone our age. I’d like to offer them a big thank you!” Noah was quick to agree. These two students get credit for bringing the idea of the internship to Pace. They also inquired about funding for their school’s robotics program, which was just getting started. Pace was pleased, and continues to be excited about, supporting and encouraging these young engineers, as well as others who share the same passion. Internships and sponsorships are investments we want to continue to make. In fact, we’d like to branch out into other communities where we have divisions and offer similar programs in the years ahead. We see value in the next generation of makers. They’re our future. And based on what we’ve experienced so far, we’re in good hands. In 2000, the Product Tech Division in Maple Lake, Minnesota, joined the Pace portfolio to expand product offerings – specifically with magnesium components. Even today, the fastest growing market for magnesium is in die casting because it makes products lighter, stronger, electronically sound and reduces vibration. As the automotive world continues to search for light weighting options for fuel efficiencies, paired with the increasing amount of reshoring activities from China, the Product Tech business is seeing increased opportunities. Additionally, magnesium is highly sought after for medical devices, recreational vehicles, engineering, technology, and power and hand tools. Through Product Tech, we’re able to serve all these industries and more. Product Tech is ITAR registered and fully integrates engineering, prototype manufacturing, tooling construction and volume production activities for a seamless product development experience. And as an ISO-certified division, it incorporates advanced lean manufacturing principles to create additional value for customers. Another important note is that Pace adheres to intensive early supplier involvement and offers dedicated resources that can embed at customer sites to ensure manufacturing design optimization. This division also offers in-house tooling production and repair, and rapid prototyping to reduce time to market and ensure a more consistent supply chain. This division is also in the process of a 60,000 sqft addition to the existing building, which means the available manufacturing space will nearly double in size to a total of 110,000 sqft. This expansion will allow Product Tech to expand in the areas of large tonnage machines and newer technologies that can deliver lightweight products with high structural integrity. At Pace, we strive to provide unique, creative die casting and support solutions that contribute to the success of our customers. Product Tech is a key component to achieving this mission, and we’re excited to see them continue to grow and innovate. When most people think of aluminum, it’s in reference to a soda can or long strips of foil used in the kitchen. An interesting thing about aluminum is that it’s actually found in many places, such as doorknobs, kitchen utensils and even glass production. And it continues to gain traction in many industries. According to the Aluminum Association, it has been produced in commercial quantities for just over 100 years, which makes it a comparatively new industrial metal. What makes aluminum so popular? In addition to being the second most abundant metallic element in the Earth’s crust next to silicon, it’s easy to mold, fold and recycle. This creates a long list of benefits for things like packaging, transportation and construction. With Pace being an aluminum die casting company, you can imagine our appreciation of this prevalent element. We believe the more that’s understood about the benefits and uses of aluminum the more we can innovate and advance technologies around this plentiful resource. With that in mind, we’d like to share a few interesting facts. Aluminum is green. There are two types of aluminum: primary and secondary. Primary production is the process by which new aluminum is made. Secondary production is where existing aluminum is recycled into another usable form. This secondary process is extremely environmentally friendly. In fact, it’s 92 percent more energy efficient than primary production.With the ability to recycle aluminum so easily, there isn’t a high demand for mining new resources. The Aluminum Association reports that 75 percent of aluminum ever made is still in use. In our own operations, Pace uses only recycled aluminum. It’s more cost effective and also a responsible way to operate. Aluminum is extremely lightweight. According to the S. Geological Survey, it’s a third of the weight of steel or copper. What this means for Pace is that it allows us to have greater design capabilities. We can develop products that allow for lightweighting, which is critical for many of our customers – especially those in the aircraft, boating and automobile industries. Lighter machines translate to less energy required to operate. Aluminum plays well with others. The unique properties of aluminum alloy allow the metal to work well with a steel die, which is what Pace uses. The process moves quickly with aluminum, and we’re able to get fine details on a part. This can eliminate secondary operations and allow us to combine parts. That means less assembly for castings that are lower cost and with a finer detail. Aluminum was born out of science. Aluminum isn’t naturally found in the Earth’s crust. It comes from bauxite, which has to be processed to get aluminum. What this means is that it required the efforts of chemists and engineers to bring it to life. Essentially, innovation made this metal possible.As an interesting fact, Danish chemist Hans Christian Oersted first extracted aluminum from alum in 1825. It remained a novelty and too expensive to mass-produce until 1886 when American chemist Charles Martin Hall and French chemist Paul Héroult independently invented the Hall-Héroult process, which is still used today. Aluminum is getting stronger. Scientists continue to search for ways to improve aluminum, and there are currently hundreds of mixes on the market. One of the most recent breakthroughs was in 2010. Yuntian Zhu, a professor at North Carolina State University, and his colleagues subjected aluminum with magnesium and zinc to extreme pressure. The result was an aluminum that’s as strong as steel.The next phase of development is to produce this in large enough volumes for commercial applications, which will be a game changer for many industries. With so many applications and unique benefits, it’s easy to classify aluminum as the metal of modern life. We’re excited to continue innovating with this resource and watch how it will transform the world around us in years to come. For a complete history of aluminum, check out this article by the Aluminum Association. In 1998, our Chihuahua Division opened primarily to service customers in Juarez. Since then, the operation has grown to service customers throughout Mexico, the United States, United Kingdom and Asia. Our facility offers 210,000 square feet of manufacturing space, and through recent lean initiatives, the operation is well-positioned for additional customers and growth. One of the aspects of this division that makes it so unique is its geographic location. We service many U.S. corporations that operate in Mexico who need quality die cast solutions. By providing products to clients who are geographically close, we are able to execute a localization strategy that allows us to manufacture high-quality parts at an affordable cost. Our Chihuahua Division capabilities include machining, simple drill and tap operations to complex CNC operations. We also offer finishing operations including trimming, deburring, shot blasting, painting, chromating, impregnating and more. Value add services include fully machined and assembled components, providing customers a complete solution. With these capabilities, we serve in the automotive, telecommunications, lighting, electrical and industrial controls industries. The education assistance provided at our Chihuahua Division is what sets this facility apart. In the past 5 years, we provided assistance to allow 60+ people to earn their High School diplomas, approximately 40 people to earn a Bachelor’s Degree and some to achieve a Masters of Business Administration. “An investment in associates is paramount, and that includes a commitment to training and education,” said Doug Walker, Executive VP of Operations in Chihuahua. Our excellent management team at the Chihuahua Division is constantly working to provide uncommon solutions to our customers. Working together with our customers, we can help develop die casting designs that satisfy functionality and castability requirements and exceed expectations. 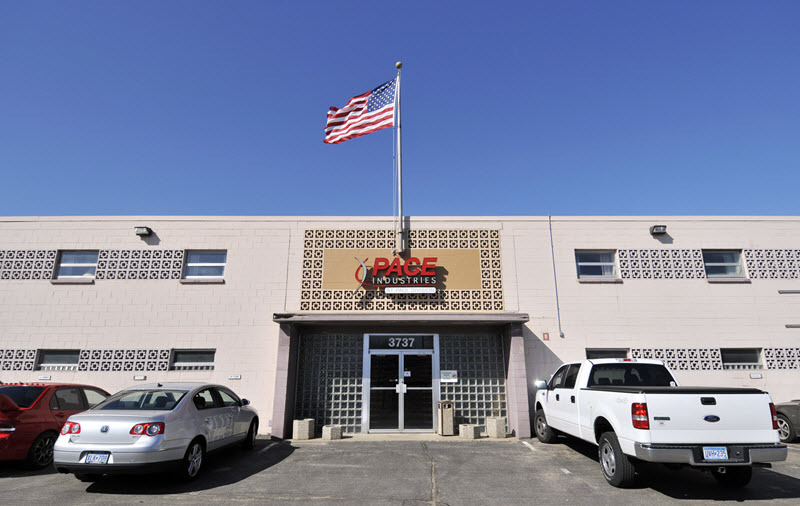 The fact that Pace is the largest custom die casting company in North America is the direct result of our associates’ experience and hard work. Our company is staffed with some of the most talented professionals in the industry. In order for us to keep growing and innovating, it’s essential we recruit from a well-trained talent pool. We’re faced with a unique situation, though. America is experiencing what educators and industry officials call the “skills gap.” This refers to the disparity between the high number of jobs opportunities and the low number of qualified applicants. With technology making huge advances every day, jobs are becoming more and more technical, thus requiring more education. The problem is that students aren’t seeking education in these areas. They believe trade skill jobs are a dead end, but that couldn’t be further from the truth. Students who have knowledge of these trade skills are more valuable than ever, allowing them to achieve high wages and rapid job growth potential. Our company is dedicated to finding these students with knowledge of our industry and offering them an opportunity to begin an excellent career. These students are the future of Pace. And we expect the same qualities from all associates, whether they have 35 years of experience or are fresh out of high school. We want our associates to join in our culture of innovation, excellence and dedication. Part of our solution is to put strategic programs in place to help develop incoming talent. We’ve offered job shadowing, internship opportunities and now have a new scholarship program. This new program is called Pace Scholars and is available for students attending North Arkansas College (NAC) in Harrison, Ark. who have an interest in manufacturing. There are a total of 20 individual $1,000 scholarships available to high school seniors on their way to NAC. For anyone interested in applying, contact our HR team. Our customers have great needs in quality and production, and we have to be prepared to meet those higher needs and perform well. The bottom line is that recruiting is at the top of our list when it comes to making smart investments for the company. We want to continue growing, and training and hiring the best associates will remain the key to our success. As our clients see our new successes with our talent and technology, our business partnerships will grow. Pace Industries is North America’s leading full-service aluminum, zinc and magnesium die casting company. Pace is a solution provider, offering a wide array of capabilities and services, including: advanced engineering, tool making, prototyping, precision machining, assembly, finishing and painting. Headquartered in Fayetteville, Ark., Pace operates 12 divisions, 21 manufacturing facilities and has more than 4,000 associates across the U.S. and Mexico. Learn more at www.paceind.com. We at Pace know our customers are looking for superior service, quick solutions, and low costs. Our team at the Airo Division, located in Loyalhannah, Penn., is committed to continually improving performance to meet customers’ quality, cost and delivery requirements. Our Airo Division was founded in 1975 for the express purpose of producing aluminum die case compressor blades for the nuclear industry. Since then, we have grown significantly and currently serve a variety of specialized industries, including automotive, motorcycle, recreational vehicles and heatsink technology. With our technical background, experienced staff and management team, we can become a company’s single source for precise aluminum die cast products. We specialize in full-service supply chain management, providing tooling design and management to customers primarily in the automotive, recreational vehicle and lighting industries. We routinely produce complex parts that are sensitive to specific porosity and cosmetic requirements and provide on-the-ground engineering support to ensure accurate product design and manufacturing. At Pace, we are committed to forming partnerships with our customers to focus on their needs, wants and expectations. We provide superior service by consistently achieving on-time deliveries, exceptional quality and competitive pricing. It is with a steadfast focus on quality, safety and cost that we are able to provide quality, cost-effective solutions in our Airo Division and throughout the entire Pace organization. We are facing tomorrow’s challenges today and transforming our customers’ concepts into functional, cost-effective die casting solutions. We are on the verge of a major shift in the auto industry. The Aluminum Association boasts aluminum as the fastest, safest and most environmentally friendly way to increase performance and fuel economy in vehicles, without compromising safety or durability. It is estimated that automakers will consume nearly 23M metric tons by the year 2020. That’s a 65% increase from today’s usage. Paving the way for vehicle bodies made out of aluminum, rather than steel, is the Ford F-150 pickup. This is significant because it shows that for the first time, aluminum is being deployed at mass production. This proves aluminum can be a viable substitute for steel. We’re also seeing Chevrolet tapping into the aluminum-body trend. In 2014, the Chevy Corvette was redesigned to use an aluminum frame – and it doubled sales. They also have plans to begin using aluminum hoods on their mid-sized pickups, the Colorado and GMC Canyon. Addressing customer concerns is something Pace doesn’t take lightly. Whether the concerns are specific to a part or vehicle in question, we are able to work with automakers to find viable and cost-efficient solutions. Through early supplier involvement, we are able to work early on with engineers on design activities, and develop designs that are easier to cast. This reduces time-to-market and lowers the overall production costs. In addition to aluminum bodies, automakers are turning to aluminum to meet fuel efficiency requirement. Fiat Chrysler Automobiles is using various aluminum components to boast their top-selling Ram as having 25 MPG on the highway. This is the highest of any full-size pickup with the gasoline engine. The aluminum industry continues to make breakthroughs in technology, and automotive manufacturers are showing a willingness to produce stronger, lighter and environmentally sound vehicles. As more demands are made and better technology is discovered, more and more vehicles will become increasingly aluminum intensive. We continue to see an upswing in demand for aluminum automotive needs and our recent merger with Port City Division positions Pace at the forefront of this trend. Pace is dedicated to providing our customers with great, cost-saving solutions. Not only are we equipped with the most advanced technology, we understand the need to move nimbly and to quickly alter or adjust plans as needed. What will be the next wave of aluminum components? Only time will tell, but one thing is for certain. As our industry changes, Pace will remain at the forefront to provide the best quality solutions in ways that save our customers money. Darren Bombich, Eric Waa and David McWilliams. In training our suppliers about Pace Industries and our die casting capabilities, we begin the process of Early Supplier Involvement. As we’ve discussed in earlier blogs, Early Supplier Involvement is where our greatest opportunity lies and allows us to work with our customers to find uncommon, creative solutions. Pace’s St. Paul Division, which produces aluminum die castings for highly cosmetic, complex and difficult-to-fill parts and specializes in flash-free, net-shape production, has become a shining example of this practice. The St. Paul team recently visited GHSP, a leading global supplier of mechanical and mechatronic control systems to surface transportation industries, and held a Lunch and Learn in an effort to educate on zinc and aluminum die casting. Not only were they able to discuss services, capabilities and processes, but were able to showcase some of the parts St. Paul had die cast for GHSP for the 2015 Ford Mustang. These parts were recently featured in this Detroit Muscle episode on Power Nation TV. The benefits of the Lunch and Learn were being able to teach and familiarize GHSP’s purchasing team, engineering team and quality team with die casting, the processes involved and the tolerance involved. The results were positive from all teams who felt the meeting allowed them to view Pace as an advisor on future opportunities and gave them a direct contact to follow up and ask questions. When conducting your own Lunch and Learns, it’s important to know who your audience is so you can flavor the presentation towards that group of people – an engineering group loves data and very technical information, while a purchasing audience requires less details and more of a bigger picture. Take the time to truly understand your audience and tailor the presentation to them. We are pleased to announce that the North American Die Casting Association (NADCA) has awarded Pace Industries with four honors this past year. This is a prestigious international competition that brings the best designs in die casting together. Each is judged on the difficulty to cast, the brilliant engineering required and the benefit and value that the design delivers to the customer. The Cambridge Division won the 2015 International Die Cast Competition for Aluminum Die Castings 1 to 10 lbs for the submission of the JAMCO arm rest. This was an extremely difficult part to design as a die casting. Full credit must be given to Don Tremblay for the excellent design engineering. Don worked tirelessly with the customer, establishing confidence in Cambridge’s engineering prowess and convincing them of the design changes required to make this a successful conversion to a die casting. The overall success of this program extends to our total Engineering and Manufacturing group. Working as a true team, focused on the success of the project, we delivered excellence to our customer and delighted them with our performance. Our St. Paul Division took second place for this category with its Diffuser Grilles. The amount of detail, looking at a market that normally doesn’t have die casting in it, was particularly impressive to the judges. They also noted how well executed it was for the St. Paul Division to take a bunch of different parts and integrate them into one usable part. Grafton was awarded the 2015 International Die Cast Competition for Aluminum Die Castings over 10 lbs category for the 824 Crankcase. Beau Glim, Project Manager at NADCA, stated that what made an impression on the judges was the jet cooling. It is something that is typically very difficult to cool so to see it cool that quickly for die casting was an amazing feat that resulted in this award. The Product Tech Division won the 2015 Casting Competition for Magnesium Die Castings over .5 lbs category for the Multispeed Wheel. The judges found the wheel to be very innovative. They were impressed by the detail, the control, and the very unique application for die casting that was demonstrated by the Product Tech Division. 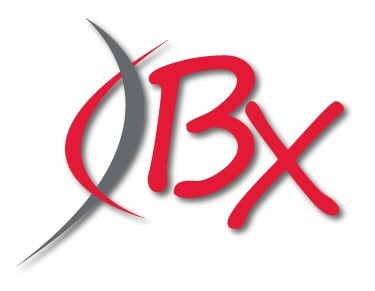 After operating as a family-owned and operated business for 14 years, B & C became part of Pace Industries in 1998. Pace Industries B & C Division specializes in 100% zinc die casting serving the automotive, electronics, lighting and lawn and garden industries. In addition to zinc die casting, B&C provides a variety of additional capabilities to serve their wide-range of customers. Capabilities include single spindle drilling and tapping operations, CNC machining, dedicated multi-slide machining centers and component assembly. Along with conventional and multi-slide die casting capabilities, B&C boasts automated machines capable of producing flash free intricate castings in their TS 16949:2009 certified facility. At Pace, it’s our people who make the difference – who help differentiate our organization from the competition. So, as Dan Krinock transitions from president of our Airo Division in Loyalhanna, Penn. to a consultant for Pace leadership on special projects, we’re using this space to celebrate the man who dedicated nearly four decades of his life to the die casting industry and our Airo Division. After all, it would be difficult to tell the Pace story without feeling Dan’s influence. “Dan always had a vision of what the next step should be and was able to communicate that vision – from the operator on the floor to the leadership of the company,” said Vinnie Battaglia, who worked side by side with Dan for the majority of his nearly 40 years at Airo. Dan’s ability to innovate and lead has always been among his greatest traits. In 1976, he helped establish an identity for Airo as one of just two die casting facilities in North America capable of manufacturing blades for the gaseous diffusion industry. By the following decade, the Loyalhanna-based facility had evolved into a leader in the casting of conversion boxes for the booming cable television industry. In the late 1990s to early 2000s, he orchestrated the implementation to robotic technology, a central melt system and the facility’s first reciprocator. Under Dan’s leadership, Airo has emerged today as a 155,400-square-foot manufacturing facility with a full range of services and capabilities for the automotive, motorcycle, recreational vehicle and heatsink technology industries. Vince Battaglia, Gordon Silvis, Don Frayvolt, Dan Krinock, Tony Rich, Rick Levrio and Sam Snively. It’s that approach that helped earn Airo the top Jobs First Governor’s ImPAct Award in June 2014. The award ­­– presented annually by the governor of Pennsylvania – recognizes businesses across the state that have made a positive impact on local and state economies through consistent job growth, associate retention and development. Dan made a habit of extending that level of passion and enthusiasm beyond the walls of Airo and into the surrounding community. “Dan was one of the first people I met when I became president of the area chamber of commerce – and he’s always been one who just makes things happen,” said David Martin, president, Greater Latrobe-Laurel Valley Community Chamber of Commerce. “He’s always there, helping improve quality of life and working to create opportunity. That’s the level of commitment Dan used to blaze a trail of success. Krinock Family with CEO Scott Bull (Black sweater) seated next to Dan Krinock. As Dan transitions into his new role as consultant to Pace leadership on special projects – and eventually into retirement – he’ll be doing more fishing, golfing, and spending quality time with family. And, he’ll be the first to tell you, it’s time to ramp up the number of outings with his hunting buddy, his grandson. Thank you for a job well done, Dan, and enjoy this time of transition. You’ve earned it. Be honest about what you can do with your abilities. Few people will have all the skills needed on a new job. But, if you have had similar experiences that would make the job easier to master make sure to mention them. Most importantly, figure out what you have to offer Pace. Always update your social profiles before applying to a new job. When we research your job history, we’ll want to find the skills and abilities that are already listed on your resume. Write about a problem you’ve solved before or can solve as it relates to the opening you are applying for. Any skills you can bring with you to a new job is going to be a plus for us here at Pace. Anything we do not have to train you on is a benefit and makes you a more valuable hire. Be realistic in your compensation expectations. Pay is a big component of your benefit package, but things like vacation time, insurance, chance for advancement and work environment go a long way in making a quality work life. So, make sure you look at the entire package and not just the dollars. Also, make sure you research the company and location. Compensation varies greatly around the United States and it’s important to know the environment if you’re relocating. Make sure your family is behind you and supports you in this new career. Change is hard on not just you but everyone around you. Learning new skills and a new work environment can affect your mood, which will affect everyone in your household. So, make sure they understand your career path and your immediate focus. Commit to investing in your career through your own personal efforts and growth. Any new job and work environment will present a whole host of opportunities for you to improve your skill set. Make sure you’re open to the challenge, willing to try new ways of doing things and be optimistic about change. If after reviewing the above steps, you feel ready to proceed, go ahead and APPLY NOW! Pace offers great potential for a long future in the manufacturing industry. We are excited about reviewing your application and look forward to fitting your skills and expertise into the perfect position. B&C Die Cast was founded in 1984 as a family-owned and operated business. They soon built a reputation and became one of the leaders in the industry with their quality product and service. In 1998, B&C joined the Pace family, specializing in 100% zinc die castings. B&C produces flash free intricate castings in their TS 16949 certified facility because of their conventional and multi-slide die casting skills. Aside from die casting, B&C offers in-house machine and assembly experience to provide customers with options. Skills include: single spindle drilling and tapping operations, CNC machinery, multi-slide machine centers and component assembly. Below is a glimpse inside the factory’s day to day operations. JEL is known for its quality work and solutions in chromating, phosphating, wet painting, robotic electrostatic painting, silk screening, pad printing, stenciling as well as multiple automated powder coat systems. They are the authority on finishing aluminum parts, notably die castings. JEL, which stands for JapEnameLac, started as a finisher in the late 20’s as Nye’s JapEnameLac. Nye is short for Nylander, the family that started the company and ran it for two generations. JapEnameLac is a mash up of terms: Jap for Japanning, Enamel for enameling and Lac for lacquering. Although enameling and lacquering are commonly known terms and processes, many people often ask what Japanning is. The process of Japanning originated in the 18th century when gloss black finishes were applied to emulate the lacquer work of the Japanese. Ironware was typically japanned black for decorative purposes, but it also rendered the ironware rustproof, making it capable of carrying water. When the company was founded, Japanning was a process for obtaining a baked on gloss black finish, typically used on early coaches. The Nylanders actually japanned the wheels for Model A Fords. In the 80’s, when the company was sold, the Nye’s name was dropped; JapEnameLac was shortened to JEL and completed to what there is today, JEL Finishing. Throughout the company’s history and all of the many projects, JEL is proud of every piece of work they put out. A few notable projects JEL has worked on is the powdering and painting of parts to support American troops during the Iraqi conflict several years ago. JEL was tasked by the Army to finish reactive armor for Abram Tanks and parts for the netting system that QinetiQ developed to stop RPGs from killing troops in their lightly armored vehicles. But, you might also notice some of JEL’s projects everyday – the white satellite tracking dome on the back of tractors going down the highway, JEL painted every one of them for Qualcomm. When a helicopter flies overhead, if a Flir infrared camera is attached to it, JEL was responsible for painting it. And not to drop names, but if you go to Fenway Park, you may see some tables and stools JEL powder coated for the Red Sox. JEL Finishing’s most recent and outstanding accomplishments was being named one of the best finishing shops in North America, according to an industry benchmarking survey conducted by Products Finishing magazine, a trade publication which has covered the industry since 1938. JEL’s quality, customer service and technical expertise make them stand apart from other job shop finishers. The fact that they are integrated with in-house pretreatments such as blasting, chromating and zinc phosphating, can painting or powder coating small and large jobs, assembling hardware and also offer expert masking and printing services sets them apart from others. They are a solution provider offering a wide array of capabilities and services. They preach and practice safety first and respect and value every associate. JEL’s associates are their best assets. STEAM vs. STEM is an ongoing debate about the importance of art and design courses offered in public education institutions and whether or not they improve student behavior, test scores, and so on. The STEAM side argues that Art plays a vital role in letting students express themselves and helps them engage in critical, “outside the box” thinking. Even after 42 seasons of STEM-only teaching, famous children’s show Sesame Street decided to finally integrate the arts into its 43rd season. That said, pro-STEM advocates aren’t necessarily calling for the elimination of art and design classes in school, but instead wish to retain a higher focus on science, technology, engineering, and math, the core subjects that make up STEM. Some facts that come out of STEM-only research shows that students who progress through at least Algebra II in high school are twice as likely to complete a four-year degree as opposed to those who don’t. Of 15 Major categories, Engineering has the highest median earning, yet less than 20% of students choose a STEM path. Lastly, women make up 23% of STEM workers, but make up 48% of all occupations. More information and summarized research can be found on this round-up by the National Math + Science Initiative. While brilliant with technology, there are some personalities who STEAM advocates feel were the best of both worlds, such as Albert Einstein, Marissa Mayer, and Steve Jobs, the latter who revolutionized how marketing is done today. William Yu, an economist with the Anderson Forecast at UCLA, states that as more jobs become machine-reliant, alongside economic shifts from agriculture to mechanical, “robots and foreign labors will never be able to replace creative people in creating sectors making new and desirable products and services.” Alongside this, this piece by edutopia.org explores exactly what skills apply to adding the “A” in STEAM. The program mentioned includes the Four C’s: creativity, collaboration, critical thinking, and communication. By breaking these segments down, professors are more capable of allowing students to take advantage of their education; something that is evidenced by research showing more students wish they had learner agency in STEM education. Shifting gears, as more machines are developed to help industrial markets and manufacturers, it’s important to note what jobs STEM-geared education creates. For example, in the die-casting industry, half of the jobs wanted require four years of education or more just to reach entry level. While not all of these jobs fall into this spectrum, they include engineering, IT staff, drivers, mechanics, nurses, machinists, and operators. According to this 2015 report by the North American Die Casting Association (slide 20), as the volume of castings required grows, the minimum number of workers hired annually will also increase. This will eventually lead to a need for, at minimum, 2,500 new operators and technicians. Job processes for these careers include operating machinery, casting, maintenance, safety and energy management, tool designing, and melting and handling. With such an array of specialized job functions, it’s easy to see why half of the top 10 most difficult positions in die casting are hard to fill. Where STEM seems to fall short is within the creation process of prototypes or newly realized tools. The “A” in STEAM better serves those who seek to change how tools work and the convenience they bring to the table, while STEM focuses more on bringing those concepts into reality. Regardless of the side chosen, education drives markets forward. STEAM vs. STEM may still be an ongoing debate but it’s important to know where to draw the line in the sand and focus on the benefits of each. Does your business grow and prosper more from a creative or mechanical standpoint? Pace Industries is the leading full-service die casting company in North America. Our Harrison warehouse is more than 600,000 square feet where we specialize in die casting zinc, aluminum and magnesium. Die casting is a quick and more cost effective production process that produces a high volume of parts than other casting processes. Aluminum die casting has become the first option among buyers worldwide because of its cost effectiveness and the various finishes it can be cast in. This is possible because its structure is light, strong, corrosion resistant, non-staining, non-magnetic and highly conductive. Buyers in this industry also like that the aluminum alloy is 95% post-consumer recycled material, making the die casts green and sustainable. Some of our capabilities include Robotic Extraction, Hot Oil Die Heaters, Automated Sanding Cells and much more. Our die cast machines ranging from 600-1800 ton allows us to serve many industries. Get to know us a bit better by taking a look at a day in the life at Pace Industries. We are excited to welcome Port City Division to the Pace family. Together we look forward to working together to take advantage of all the best practices and synergies to help stay at the forefront of the industry and continue to provide uncommon, creative solutions which contribute to the success of our customers. FAYETTEVILLE, Ark., and MUSKEGON, Mich., July 1, 2015 – Pace Industries, North America’s largest full-service aluminum, zinc and magnesium die casting company based in Fayetteville, Ark., announces the merger with Port City Division in Muskegon, Mich. 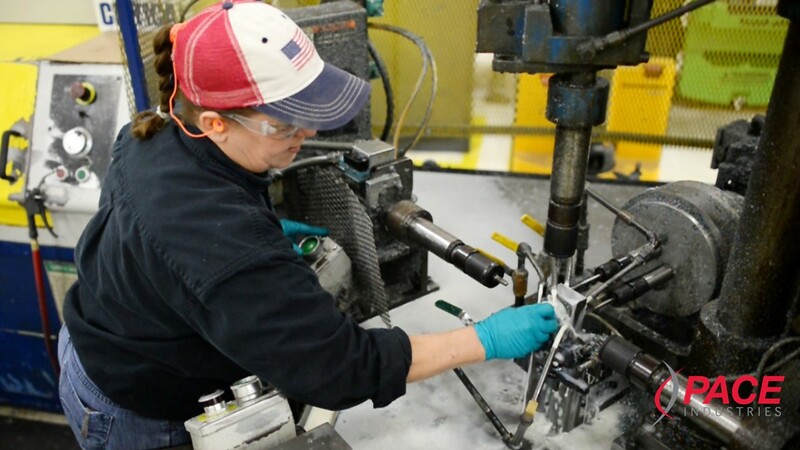 The merger will provide die casting, machining, manufacturing and finishing capabilities across diverse industries including automotive, lighting, electrical, recreational and others. The combined company will consist of 12 divisions and 21 facilities with sales of approximately $600 million across the United States and Mexico. Port City Division will become a division of Pace Industries. John Essex will remain CEO of Port City Division, join the Pace Board of Directors, and become one of its largest shareholders while leading Pace’s automotive growth strategy. According to Bull, the companies will work together to take full advantage of best practices and synergies, which will provide both organizations the capabilities and resources to meet and exceed customer expectations. Pace Industries has many die-casting factories all over the country and even in Mexico. Our plant in Harrison, Ark. is known as a leader in thin wall and large mass castings for large volume customers in the lawn and garden, lighting and automotive industries. We have a variety of highly complex casting programs that require sophisticated automated robots to help streamline processes and a large work force to keep production moving. In order for businesses to succeed in a highly competitive and volatile market, it is critical to partner with the right manufacturers; manufacturers who are large enough to take on any project size, innovative enough to recommend uncommon and cost saving solutions, yet nimble enough to quickly adjust and alter as needed. Pace Industries is just such a company; uniquely positioned to meet the ever-changing market demands of our customers. What makes Pace so unique? Size and Capacity: The size of our company both financially and in footprint is unmatched. Pace currently has eight U.S. sites and two sites in Mexico. Within these sites, there are over 200 die cast machines and over 300 CNC machines. We have our own in-house tool shops that assist our customers in designing the most robust and economical tool for each product design. Having multiple well-equipped sites enables us to provide flexibility in scheduling, capacity and manufacturing, ensuring that customer’s needs are met. Technology: The technology we employ at these sites runs the gamut from the very basic or standard to very advanced state-of-the-art technology. This array of technology enables us to match our customer’s timeline and cost requirements. Flexibility: Our flexibility with equipment across several sites allows us to respond to customer supply interruption issues quickly and successfully. About 3 years ago, one of our largest customers’ competitors suffered supply issues due to a long supply chain from overseas. The market share that this competitor lost became available to our current customer. With our sizeable footprint and flexibility and large inventory of equipment, Pace was able to increase supply of parts to our customer in a very short period of time enabling them to capitalize on this changing market demand opportunity. Additionally, in 2013, our largest operation suffered a major supply interruption that was going to last for many months and potentially impact shipments to several key customers. Because of our overall company flexibility with equipment capacity and personnel, Pace was able to relocate over 250 tools and approximately $50M in annual sales from the affected plant into other Pace operations with very minimal impact to our customer’s market demands. Early Supplier Involvement (ESI) program ensures and optimizes design of die cast parts right from the start which can save customers a lot of money and time by incorporating features which are efficient and cost effective. In Production, we adhere to an APQP process in product introduction that helps deliver a more efficient and timely launch of new programs. Our Thermal Control Systems, preventive maintenance programs, DMOs, molten metal management, automation, SWAT teams, Internal Rebuild Teams all help Pace and ultimately the Customer improve their position in the marketplace and helps support market demand. Executive VP of Sales, Brian Walker, shared an example where one of our clients, a US based manufacturer, implemented a market driven manufacturing model to align with retails sales demand. Pace re-engineered the manufacturing approach, adjusted Kanbans, improved product flow and long range planning to successfully meet these requirements. Our result has successfully reduced manufacturing costs while delivering on customer expectations more consistently. This resulted in market share gain, increased sales and improved margins for the client. Meeting our customers’ volatile market demands is a very important aspect of achieving our Mission Statement. Pace differentiates itself from its competition by its flexibility to respond to many different types of market demands, from technology needs, which drives to different levels of product requirements and costs, to successfully responding to changing market demands or supply chain interruptions with its flexibility in the area of equipment and personnel across many different locations. In these specific areas, Pace is living out its Mission Statement to “Provide uncommon, creative solutions that contribute to the success of our customers”. Give us a call today to see how we can help ensure your success. It’s the details that make the difference. 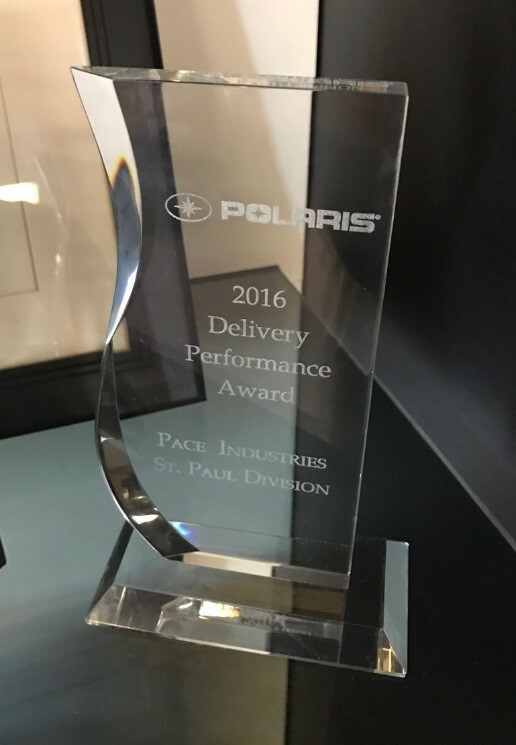 Pace Industries St. Paul Division proved that recently by serving one of our customers with a unique need — and we were rewarded for it. Webasto-Edscha Cabrio USA, a manufacturer of automotive convertible roof systems, came to us with a request that looked simple enough on the surface: Supply an overmolded and machined die cast aluminum operating handle for the convertible top on the new Ford Mustang. When they shared their need for a tight turnaround and approval time with us, that’s when things became a little more interesting. As you can imagine, any component added to an automobile must go through a rigorous approval process by the vehicle manufacturer for safety and durability. It was discovered early in the APQP process that Webasto had specified a neoprene-type overmold material that had not been approved by Ford. The customer was facing the reality that they might not be able to deliver a solution before the new Mustang was slated to hit the streets. The St. Paul team was quick on our feet to come up with a solution. By thinking outside the box, we found a material that was already used elsewhere in the vehicle that we thought might also work for this application. We were right. Using this already Ford-approved material allowed the engineering change process to fast track, which solved Webasto’s timeframe problem. It also ensured they got parts at the price point they needed to provide a smooth, on-time launch for the new Mustang. Full utilization of the APQP Workbook at St. Paul is partially to credit for the award. Of course, all those processes don’t mean much if there’s no one there to implement them, and our team stood up to the challenge. Check out this video on the new Ford Mustang convertible, which includes highlights on the all-new convertible roof system and a look at the operating handle supplied by Pace’s St. Paul Division. At Pace Industries, we pride ourselves on being a true partner with our customer. We’ve long recognized that we need to set ourselves apart from the rest in order to earn and keep your business. Our mission statement is to find uncommon, creative solutions that contribute to the success of our customers. One of the ways we do that is through our desire and ability to optimize cost for our customers. Cost optimization can be achieved in a number of ways. We are committed to a lean manufacturing process whenever possible. By reducing waste, streamlining production processes and design, as well as improving workflow, our customers benefit by having reduced time-to-market and lower overall production costs. However, Early Supplier Involvement is where our greatest opportunity lies. By working early on with your engineers on the design activities, we can develop designs that are not only functional, but are also easier to cast. There have been multiple times that we have been brought into a project during the design phase and we have been able to reduce metal content, adjust shapes to improve productivity, and even offer alternatives like different alloys that would reduce the cost and meet customer criteria. For example, we suggested a novel approach for a customer who had an automotive application. Typically, the part would be manufactured using a non-die cast process, but we felt that a die cast product would give them the functionality needed but at a lower cost of production. After we conducted casting design training sessions with their engineers and applied our education and expert guidance, we were able to show them how die casting would be a more cost efficient method of manufacturing for them. In another instance, we worked with a lighting customer on a fast track LED project. At the time we were brought in, they already had a near final design. After review, we realized it wasn’t possible to manufacture the part in its current state. Following two days of discussion and revision, we were able to optimize the design for manufacturing, and remove more than two pounds of aluminum from the design, reducing the cost by several dollars. Not every manufacturer has the capabilities to work with you in this way. We put a significant focus on working with our customers to find solutions to optimize cost. Being a full-service die cast company means we have the resources and technical expertise to partner with our customers early in the design phase and also once the part is in production. To truly optimize cost, you need more than a good price or a low margin. The value we provide in product design, weight reduction, keeping proper inventory levels on hand, close proximity to delivery locations, internal tool shops, good quality, and other benefits are what truly optimizes the cost of doing business with Pace versus other die casters. We welcome the opportunity to show you how we can help you achieve the right balance of design, function and cost. My background in the die cast industry up until 1995 was centered on aluminum and zinc. About that time, I was offered an opportunity to work with some people who had a desire to start up a Magnesium Die Cast operation. It sounded exciting, but wait a minute; I didn’t know a thing about magnesium. I started reading and absorbing everything I could find on the subject and quickly realized most everything available at that time had been published 10 to 20 years earlier. The common denominator I came up with was that there were plenty of issues with magnesium – most notably, that magnesium burns at an incredibly high temperature and corrodes. At this point, I thought, this might be a tough sell. It was difficult at first because we were centered on the challenges we had heard about and not on the positives, which we quickly realized. We soon began to see that the two main issues, flammability and corrosion, were only partly true. A lot of things burn and corrode, it’s all in how you process it and work with it. Both of these conditions have proven to be controllable and can be overcome with proper processes and techniques that allow you to focus on the significant benefits of magnesium. The real benefits of Magnesium Die Cast fall into two categories: processing and material specific. In our business there are 2 basic style machines: Hot Chamber and Cold Chamber. The Hot Chamber Process we use has several benefits. 3) Hot Chamber casting reduces recyclable scrap by 30-50% versus Cold Chamber. 4) Lower injection pressure, which equals better tolerance control for precision parts. 5) Hot Chamber casting prevents many porosity-type defects. The ability to cast fine details, plus the advantage of very thin wall sections gives magnesium a significant advantage over other castable metals. With magnesium, you have an automatic 35% reduction in mass/weight over aluminum. If you combine that with thinner walls you may be 50% lighter. These benefits give magnesium a clear advantage on highly cosmetic parts. Our experience with magnesium has provided evidence that this material gives the best dimensional part-to-part consistency mostly due to the quick solidification time and a natural lubricity that keeps it from sticking in the mold. Magnesium machines very nice and with the very low cutting pressure required; very close tolerances are achievable. This low-cutting pressure also significantly lengthens the life of perishable tooling such as end mills, taps and drills. These benefits go beyond cosmetic parts. All of these advantages apply to many industries. In automotive applications, the fact that magnesium reduces vibration 25 times better than aluminum gives this material a clear advantage by reducing road vibration. Most steering wheels made today have a Magnesium core over-molded with vinyl. This improves driver comfort by stopping the vibration from reaching your hands. In any other industry that requires very tight tolerances, magnesium can often times be less expensive than the other cast metals by eliminating machine operations and provide many “as cast” features. When you combine this with the fact that magnesium die cast tooling lasts 2-3 times longer than aluminum tooling, some tangible advantages start to develop. What the Heck is Die Casting? My name is Eve Mayer and I don’t work in die casting. I am an author who works in social media, the world of words where everything we create can neither be touched nor felt with the human hand. So, when I was invited (or rather, I invited myself) to tour the die casting factory of one of my company’s favorite clients, Pace Industries, I think they thought it was pretty odd. The fact is I love factories because of my parents. For some strange reason, since I was little, they have brought me to see how all types of things are made; and because we are good eaters, it was usually food factories like Ben and Jerry’s or candy or potato chips. These experiences have allowed me to develop an appreciation and curiosity for manufacturing. Although Pace had described in detail what they do, I just didn’t completely get it until I saw it with my own eyes. After all, die casting to the outside world sounds very ominous and foreign. So, the purpose of my tour was to understand – What the heck is die casting? Die Casting is using a mold to make stuff out of metal. I’m probably not saying these terms by industry standards, but for those of us in the everyday world, I think that is what I learned that die casting is. Die casting isn’t a glamorous industry. It is a detailed, precision necessary industry where hard working people use machines to carefully craft metal pieces like auto parts, light bulb bases, motorcycle pieces, back sides of carpeting and bed springs. My view is probably skewed as I toured an aluminum factory and die casting is done with several different types of metals like zinc, magnesium and aluminum. For those of us in the world of creating intangibles, it is pretty cool to see things created that you can touch and feel. The process not only sounds interesting but also uses more necessary creativity than I would have expected. Let’s say you need a piece of metal for a specific job. First, you must design it in such a way that it can accomplish this job. Next, you need to decide whether it should be forged or die cast. Die cast means that a mold will be created typically out of precision steel and split into two halves. These halves will be put together and held there by hydraulics while hot metal is injected into the mold and cools for up to one minute before the new metal piece is released. After the piece comes out of the mold, it needs to be trimmed and polished. I thought the polish process was interesting because it basically looked like they put metal pieces into a big bowl of pink rocks and shook the metal piece around until the rough edges cam off. Some metal pieces need to be pretty and some don’t. For example, if you are having a piece built for the inside of a car engine that someone will never see once built, you don’t want to spend money on making this piece pretty, it just needs to be functional. Another metal piece might be on a motorcycle but sit on the outside of the bike in full view so it needs to be functional but also have a nice look to it. This is where specific processes that deal with painting or chroming parts comes into play. As you might imagine, the mix of machines and people with high volume makes safety very important in die casting. Pace has an interesting view that has helped them dramatically increase their rates of on-the-job safety. A Pace executive believed that safety is a mindset that is constant – meaning that safety at home and on the job cannot be separated. He asked employees to make a personal safety pledge. Employees wrote down and posted safety commitments that were important to them in their own lives and posted them near the workspace. For example, “I will not text or make phone calls when I drive.” It was pretty inspiring to see these pledges for safety hanging on the wall and to hear about the positive effects this movement has had. All in all, I really enjoyed my tour of a die casting facility. It was rewarding to see the entire process of how so many parts I take for granted are being made right here in the USA. And for us regular Joes, the answer to “What the heck is die casting?” is – it is the process of making metal pieces out of a mold. See, it’s not that scary after all.